The 131 Supermirafiori Volumetrico and the 131 Racing Volumetrico. 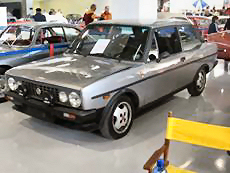 A significant part of the history of the Fiat 131 is represented by the Abarth Volumetrico versions based on the second series Racing version and third series Supermirafiori version. This is the story of Fiat’s experimentation with super-charging and its application to the road going versions of the Fiat 131. Supercharging was, in the period between the two world wars, very popular on race and sports cars as a means of boosting engine power without resorting to larger capacity engines. Until the 1950’s it was quite common to supercharge such cars. There are several online sources which provide much detail about the history and basic workings of this system. A basic explanation of Super charging and Turbo charging. 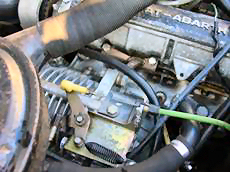 An air pump compresses the intake air together with petrol. As a result more mixture is available in the combustion chambers. The energy which is generated as a result of the explosion of this mixture is greater, resulting is more power being delivered to the crankshaft. The supercharger is driven through a toothed belt by the crankshaft of the engine. This means that the supercharger is running together with the engine all of the time. That does drain some power but the net effect is positive. The biggest advantage from a supercharger over a turbo compressor is that the extra power is immediately available at any engine speed! The turbo compressor has an axle with two finned wheels, one of which is connected to the exhaust, the other one to the air intake. Exhaust gasses make the finned wheel run very fast (in some cases over 200.000 rev/min) Because the wheel at the intake side also runs the same speed, air is compressed which brings more mixture into the combustion chamber. In comparison with the super charger the turbocharger solution does not drain power to keep the process going because it is driven by the exhaust gasses alone. 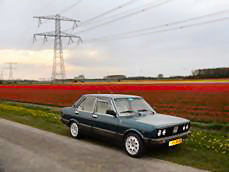 The main disadvantage of the turbo solution compared with super charging is that the turbo requires a certain revolution speed from the engine to generate its power. The time taken to reach this engine speed (and therefore generate the additional power) is known as turbo lag. The turbo lag on the BMW 2002 Turbo, for instance is notorious. Initially no additional thrust is provided before the extra power is delivered with a rush. Exciting, but not always what is needed in an emergency or even normal driving!. By mid 1975 the research and development department of Abarth initiated their own supercharger project. The then current Abarth president Aurelio Lampredi , who also designed the famous Fiat twin cam engine that is respected so much, employed a specialist to do the major blower development, testing and building. Developing this engine was his last job as an active engineer. In 1980 the first cars were available for testing. 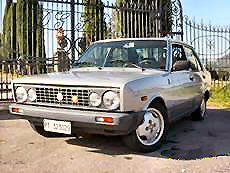 Italian car magazines of that period show Fiat 131 Racings fitted with supercharged engines. 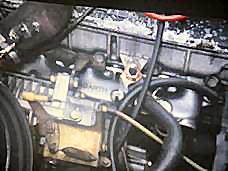 Abarth tested the superchargers on the twin cam engines with 1301 and 1995cc capacity, probably also on the 1585cc version. Officially in May 1981, 2 months after the launch of the 3rd Series Mirafiori the 131 Supermirafiori Volumetrico was introduced to the Italian market. The Racing Volumetrico was also available to order by then. 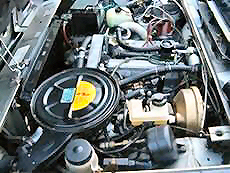 The Lancia 037 used the same type of engine with supercharger and was actually built at the same address. The development all took place at Abarth Corse, which was changed a little later into Lancia Corse. 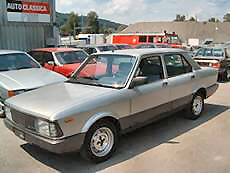 Very soon after Fiat stopped marketing the 131 Volumetrico’s, Lancia adopted the technology and introduced it to a range of existing models including the Beta Coupe, HPE Trevi and very limited the Montecarlo(Scorpion).These supercharged models carried the suffix Vx. 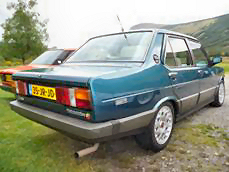 The superchargers fitted on the Lancia Beta were around one third smaller compared with the examples used on the Fiat 131 and Lancia 037 versions. 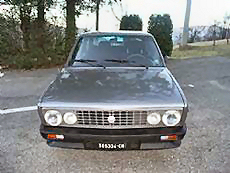 The Fiat 124 Spidereuropa Volumex and Argenta VX also had the smaller “Lancia” unit fitted. 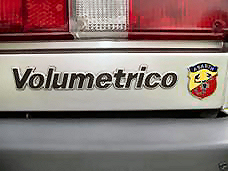 Generally people in the business name the cars fitted with the bigger units Volumetrico and the smaller ones Volumex. This is the reason that the volumetrico word is used in this story instead of Volumex or VX. 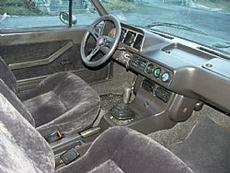 In 1984 Lancia also ceased production of their Volumex versions. 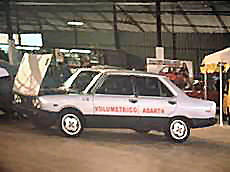 The last supercharged Fiat group vehicle, the Fiat Argenta Vx, was marketed until 1985. With Fiat and Lancia as the exceptions, in that period there was not a single marque which offered a supercharger in a production car. Interesting to note is that Lancia used both a supercharger and a turbo compressor on the Delta S4. It took years before the industry realised how worthwhile the use of a supercharger could be and we can now see at last that Mercedes, Jaguar, Volkswagen and Aston Martin are using superchargers in their production cars. 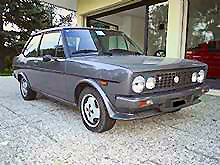 The story continues…..
Based on the third series Fiat 131 Supermirafiori , which was introduced in March 1981, the Volumetrico version followed in May 1981, exclusively for the Italian market and was available for less than 1 year. All the cars were produced in silver grey metallic. 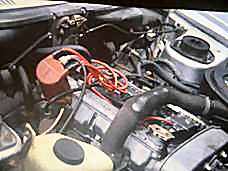 Air conditioning was not available as the cooling equipment was mounted in the same location as the supercharger equipment. The car had a list price of L. 13.590.000 which was a premium of L 3.660.000 (27%) over the price of the normal Supermirafiori 2000. These Volumetrico versions were all numbered inside the left louvre of the bonnet with red numerals. The series should have been around 200 units and number 188 is the highest number known to the author at the time of writing. 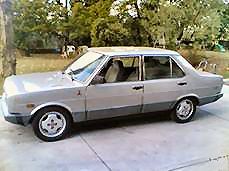 The engine code for these cars was Fiat 131 A2 V2 and the engine has type number 232 R 10. The 232R10 coded engines produce 140 DIN HP at 5500 revs and have a maximum torque of 21,8 mkg at 3000 revs. Engine with lower compression ( 7,6:1 instead of 9:1) and other pistons, valve seats and exhaust valves, crankshaft etc. Including the supercharger the engine weight is 40 kilograms extra over the standard model. 10:39 rear axle instead of 12:43 to have faster acceleration. 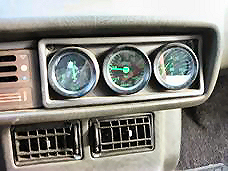 Three additional gauges fitted in the location of the radio also with green markings. 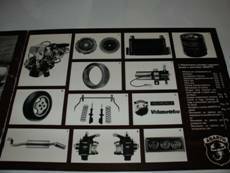 From left to right, they provided information on oil pressure, super charger pressure and oil temperature. 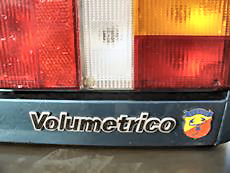 Volumetrico sign with metal Abarth shield on the left front wing. 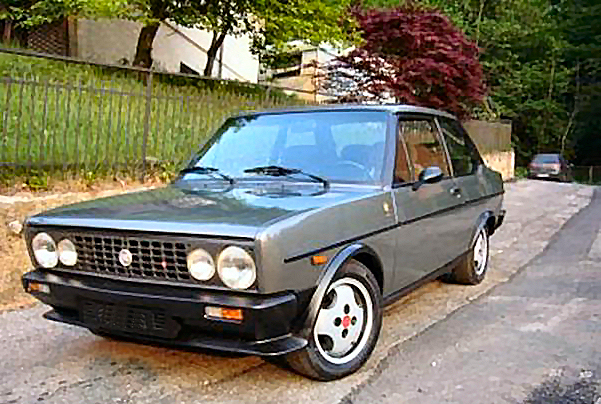 The Fiat 131 Racing Volumetrico Abarth. 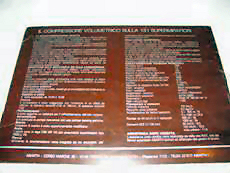 At the same time as the Supermirafiori Volumetrico became available, the Racing Volumetrico version was also on offer. The history of this car is more difficult to establish. 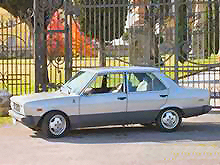 Fiat built the last 131 Racings in January 1981 as they were based on the second series Mirafiori. Then they retooled the factory for production of the Supermirafiori 3rd series. A large number of unsold Racings went to the Abarth factory and waited there (Italian sources speak of over 200 cars). This is interesting and important in its history as the Racing Volumetrico actually came on the market after the production of that model stopped! Where body colour is concerned it should be explained that of the 4 factory colours that Racings were produced in, orange was already out of production and black was only on offer for export markets. As a result it is understood that almost all Racing Volumetrico’s were either silver or gun metal grey. 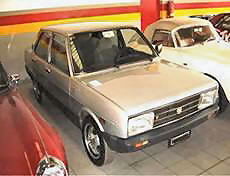 It was possible to order a 131 Racing OR a 131 Racing Volumetrico until the stocks were sold. There should have been an official production run of 25 numbered silver grey Racing Volumetrico’s. The author thinks that these cars were built before the end of production and were also used for testing. The last produced Racings which came to Abarth unsold in early 1981 did not belong to that run of 25 cars. It is known that the last cars did not sell well and that Abarth gave their workers a 50% discount on the total price from 1983 till 1984. 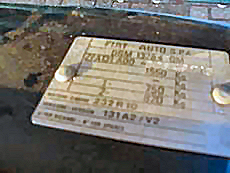 The last sold car was registered not earlier than May 1984. It is not known how many cars from this last stock of 200 or so cars were sold either as a normal Racing or Racing Volumetrico therefore it is unclear what is the total production figure. That many more were produced than the officially recorded number (25) is clear, at least as indicated by the number of cars that regularly appear for sale. The modifications to a standard car to produce a 131 Racing Volumetrico are exactly the same as those carried out to the Supermirafiori Volumetrico. The Racing Volumetrico bore the engine code AK V1. Driving a 131 Volumetrico after a normal Racing or Supermirafiori gives the impression that the car is much smoother than both. There is significantly more low down power and as a result one can drive the car with less gear changing ( read more lazily). Actually the biggest compliment you can give the Abarth technicians is that the drive is not that spectacular and instead appears almost effortless. 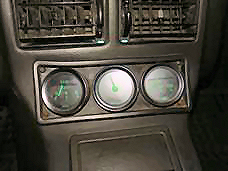 The car pulls strongly from as little as 1500 rpm until the red line. The extra power raises the top speed above the standard car -. Abarth claims 190km/h while Fiat claims 180km/h for the standard Racing and 175km/h for the standard Supermirafiori .The sound of the engine is similar to that of the normal 2000 engine except that one hears the supercharger slightly. One can also hear the electric fuel pump in the back of the car. That fuel pump aids easy starting, no matter if the engine is hot or cold. The road holding of the Volumetrico is very firm and the car feels more strongly built than the normal Racing and Supermirafiori. Braking is also stronger thanks to the larger and ventilated front discs although the braking performance is not the best performance element of the Mirafiori range. It is not easy to state anything definitive about the market value because there was only a very limited production run and there are only a few cars on the market every now and then. As a general guide expect to pay between 5000 and 9000 euro for a good car. There is actually not a big difference in value between the Supermirafiori Volumetrico and Racing Volumetrico..For less money you buy mostly a project car. Larger amounts are asked for the very best cars or examples with a specific history. The author expects that prices will get higher in the future as people begin to realise that these cars qualify as being the last “real” Abarths! (1) There are two examples of the Supermirafiori Volumetrico known to the author which are fitted with air conditioning. They bear production numbers 96 and 158. The air conditioning is mounted in a completely different location from normal. Pictures available on request. 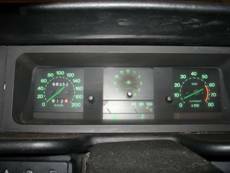 (2) Several Racing Volumetrico’s were spotted with the additional gauges fitted in the center console. For completeness, the Ritmo/Strada 130 TC had the same design wheels with ET60. (4) Several cars have been spotted with emblems on both wings, one could order the emblems separately. 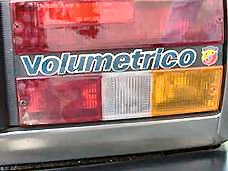 The Racing Volumetrico had the Volumetrico emblem in the right tail light. 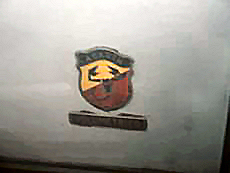 The author has seen cars with a small Abarth shield immediately behind and also with the bigger shield on the metal stripe under the taillight (same location as the Supermirafiori Volumetrico). 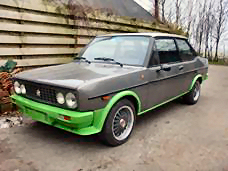 (5) The author and his Italian source never saw a numbered Racing Volumetrico but heard the story regarding possible production numbers from a mechanic who worked for Abarth in the early eighties. (6) Both the author and his sources expect a production figure of around 100 Racing Volumetrico’s but it could be less or even more. A big thank you goes to Mauro Balcet from Italy as he was extremely helpful with giving information about the cars for creating this article. The author is always interested in more information about these specialist cars which may unravel the myth a little bit more. It took years of investigation to arrive at this stage of the story.